Tipping elements are components of the Earth system of supra-regional scale which - in terms of background climate - are characterized by a threshold behavior. Once operating near a threshold, these components can be tipped into a qualitatively different state by small external perturbations. To compare them with the human body, tipping elements could be described as organs which drastically alter or stop their usual function if certain requirements, such as oxygen supply, are not sufficiently fulfilled. The threshold behavior is often based on self-reinforcing processes which, once tipped, can continue without further forcing. It is thus possible that the new state of a tipping element persists, even if the background climate falls back behind the threshold. The transition resulting from the exceedance of a system-specific tipping point can be either abrupt or gradual. Its large-scale environmental impacts could endanger the livelihood of millions of people. 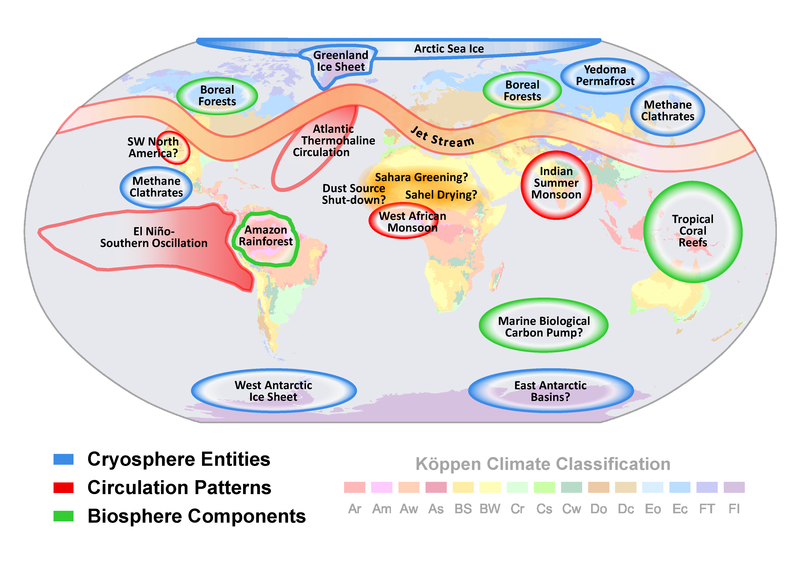 Figure: Map of the most important tipping elements in the Earth System overlain on the Köppen climate classification. There are three groups of tipping elements: melting ice bodies, changing circulations of the ocean and atmosphere, and threatened large-scale ecosystems. Question marks indicate systems whose status as tipping elements is particularly uncertain. Source: PIK, 2017. The tipping elements map is licensed under a Creative Commons BY-ND 3.0 DE license. Click on the bold titles below to access more detailed information on a particular tipping element. When ice, which is light in color, melts, it exposes a generally darker underlying surface, whether the rocky bed of a glacier or the sea. This darker surface absorbs more radiation from the sun, and this in turn accelerates the melting of the remaining ice. This mechanism, known as the ice-albedo feedback, is a classic example of a self-reinforcing process where one and the same phenomenon, namely the ice loss, acts as a driver while at the same time being the result of temperature rise. But there are many other mechanisms (described below) which make the Earth's large ice masses a tipping element. For several decades, the Arctic sea ice has been melting at an unprecedented rate. This applies not only to its extent but especially to its thickness. Arctic sea ice quickly recovers during the cold season but at the same time it is highly sensitive towards warm summers. It can thus be expected that the Arctic will be ice-free in summer by the end of this century. Due to the ice-albedo feedback (besides other processes), this contributes to an amplification of the regional warming in high northern latitudes which is currently proceeding twice as fast as the global mean1. The Greenland ice loss through glacier flow into the sea and through enhanced melting during summer has considerably increased in recent years. As a consequence, the ice sheet – three kilometers thick in places – is becoming thinner and thereby loses height. As its surface – which today still reaches into high, cold air layers – sinks, it will be increasingly exposed to lower and warmer layers of air. This accelerates the melting process. Scientific evidence indicates that the tipping point to a complete loss of ice could be already reached if global temperature rises by slightly less than 2°C2. The complete collapse of the Greenland ice sheet would cause a sea-level rise of up to seven meters over a timescale of hundreds to thousands of years. Large parts of the sole of the West Antarctic ice sheet rest on the continental bedrock beneath the sea surface – the further upstream, the deeper. Due to this topographic situation, the West Antarctic ice sheet can be destabilized by certain flow dynamics3. If the ice sheet were to break up, sea level would rise by about three meters in the course of several centuries. Scientific evidence indicates that such a process – whether with or without human input – has already been initiated4–7. While the East Antarctic ice sheet, which stores the biggest part of the earth’s frozen reservoir of freshwater, seems stable today, large basins are subject to an unstable topographic configuration as well. Recent research indicates that the melting of a relatively small “cork” – a rim of ice at the east Antarctic coast which usually holds the ice further inland in place – could trigger a self-sustained discharge of the entire basin, similar to the process in the West Antarctic region8. Thawing permafrost soils in the Siberian and North American Arctic could release huge amounts of carbon dioxide and methane. These gas compounds originate from organic material which was stored here during the last Ice Age. Several hundred billion tons of carbon are estimated to be stored in the frozen soils more than three meters deep9. Here, the heat caused by microbial decomposition of the carbon compound accelerates thawing and degradation of the soil. If the surface layer is degraded, deeper soil layers get exposed to thawing and decomposition – a process called thermokarst formation. Such self-reinforcing degradation processes would be irreversible at time scales of a few centuries, as the original carbon storage in these soils has taken thousands of years10. Methane hydrates are solid compounds of methane trapped in frozen water which are stored in sediments of the Arctic sea floor, especially in East Siberia. Estimating the total amount of organic carbon stored in these compounds remains challenging9. Methane hydrates are a slowly acting tipping element. Throughout the last millennia, the heat input from the warmer sea water has led to a slow decomposition of methane hydrates where methane is being released from the sea sediments. Methane is a short-lived but very potent greenhouse gas. Most of it oxidizes to CO2 within a decade which then contributes to warming in the atmosphere over a scale of thousands of years. There are some prominent examples of atmospheric and ocean circulation with marked (but variable) annual or seasonal patterns – but these can change. Throughout the history of our planet’s climate, there have been multiple phases of disruption and re-organization. This section gives a brief outline of potentially abrupt changes in circulation systems which could occur in the future. The overturning circulation of the Atlantic is like a huge conveyor belt, transporting warm surface water northwards and – after cooling and sinking in high latitudes – cold deep water southwards. The Gulf Stream, which is responsible for the mild climate of northwestern Europe, is part of this large-scale system of Atlantic currents. One of its main motors is the cold, dense (and therefore heavy) salt water which sinks to the depths near Greenland and the Labrador coast. If the amount of freshwater from melting ice in the northern latitudes increases, this deep water formation could cease, slowing down the circulation motor. Scientific evidence indicates that an exceptional weakening of the thermohaline circulation is already in progress11. This can have severe impacts on marine ecosystems, result in distinct cooling of the north Atlantic region, and enhance sea-level rise, especially at the US-Atlantic coast. Normally, trade winds cause an upwelling of cold water in the Pacific near South America. Warm surface water then flows – wind driven – from South America to South-East Asia. During the El Niño weather phenomenon, the trade winds are weakened and the surface water flows in the opposite direction, warming the southeastern Pacific in the region of South America. Strong versions of this phenomenon, which recurs every 2-7 years, could become more frequent under continuing climate change12. The impacts of this circulation pattern, such as persistent droughts in Australia and South-East Asia or enhanced rainfall on the west coast of South America, span the entire globe. Such a change of large-scale oceanic-atmospheric circulation patterns could also be associated with alterations of the monsoon dynamics13 in e.g. West India and South Africa. The Jet Stream, a fast-flowing zonal air current meandering above the mid-latitudes of the Northern Hemisphere at about 7 to 12 kilometers altitude, separates cold Arctic air masses from the warmer air of the temperate south. Its waves migrate eastwards and control synoptic-scale weather systems (i.e. formation of high pressure and low pressure systems) within the mid-latitudes. The air mass movement due to the Jet Stream seems to be slowing down. Moreover, its waves can stagnate leading to persistent weather systems which can last several weeks. This can in turn cause prolonged extreme weather conditions such as cold periods and heat waves, floods or droughts14–16. Up to 90% of rainfall in India comes from the regular summer monsoon. The monsoon occurs due to an internal feedback mechanism which is responsible for constant, self-reinforcing transport of humid air from the sea to the land. During a rainfall event, the condensation of water vapor in the humid air releases latent heat which in turn leads to convection (i.e. ascending flow) of warm air, entailing inflow of humid air from the sea. Both aerosols (air pollution) and land use change play a key role in this highly sensitive system. Climate change could cause the system to swing between weaker and stronger monsoon events in South Asia which would result in alternating severe droughts and extreme flooding over the region17–19. The interaction of soil moisture, vegetation and atmosphere can also trigger a shift of the West African monsoon system20. This could bring increased rainfall or increased dry spells to the population of West Africa, according to whether the rainfall belt shifts southwards to the Gulf of Guinea or northwards into the Sahel zone. In the latter case, precipitation could increase in the Sahel and favor a re-greening of the Sahara – if the region is not overgrazed. However, this greening could also have negative effects: It could cut off the supply of desert dust which is carried westwards by storms across the Atlantic, supplying coral reefs in the Caribbean and even the Amazon rainforest with nutrients. The southwestern part of North America is already experiencing declining rainfall due to the northward expansion of the subtropical dry zone. The oceanic and atmospheric circulation patterns which bring rain to the region show great similarities to a monsoon system. Thus, a tipping point could thus exist, which, once exceeded, could abruptly expose the southwestern part of North America to even more severe dryness. Climatic changes might cause an area to become too warm or too dry for particular types of plants or animals living in it, so that their ecological niches close and they can no longer exist there. Some species are able to migrate, for example further towards the poles or to a greater altitude. For species that already live in highly specialized environments such as polar or mountain regions, there is no alternative habitat to migrate to. Suitable habitats are in any case rare in a world so thoroughly exploited by humans. Climate change could alter whole regions as ecosystems with their typical climate and adapted plant and animal communities disappear. A large part of the rainfall in the Amazon basin originates from water evaporating over the rainforest. A warmer global climate with declining regional precipitation in combination with deforestation and forest fire could push the rainforest to a critical threshold. Noticeable effects of a destabilized rainforest system may occur with a time lag of several decades after the threshold has been exceeded. A transformation of the Amazon rainforest into a seasonal forest, adapted to drier conditions, or to grassland would have fundamental impacts on global climate, since around 25% of the global atmosphere-biosphere carbon-exchange takes place here. Moreover, one of the most important terrestrial carbon sinks for carbon dioxide would be lost. The transformation would also mean a massive loss of biodiversity. And biodiversity, at the same time, could be an important hope for a possible recovery of the system21. The coniferous forests of the nordic regions represent almost a third of the global forest area. Climate change increases the stress on forests caused by spreading pests, increasing fires and storm damage, while at the same time lack of water, enhanced evaporation and human exploitation inhibit their capacity to regenerate22. Once a critical threshold has been crossed, forests can be transformed back to scrub or grassland ecosystems. A loss of these forests would not only mean a destruction of habitats for animals and plants, but also massive release of carbon dioxide, which in turn contributes to accelerated global warming. Coral reefs are extremely sensitive ecosystems which are damaged by slight changes in temperature and especially by ocean acidification. Warmer water is the most common cause of “coral bleaching” which has been increasingly observed in recent years23. Bleaching means that the corals expel the algal organisms living within them and then often die themselves. Even with warming limited to 2°C, most of the current coral systems are expected to disappear24. Once a coral system has collapsed, it takes several thousand years for the reef to regrow. The world's oceans absorb large amounts of carbon – around 40% of all anthropogenic CO2 emissions are extracted from the atmosphere by the oceans. Much of this is used by algae for growth, and the carbon sinks with them to the ocean floor after they die. The function of this so-called marine biological carbon pump could be impeded by the warming and acidification of sea water as well as by the more frequently occurring oxygen depletion. 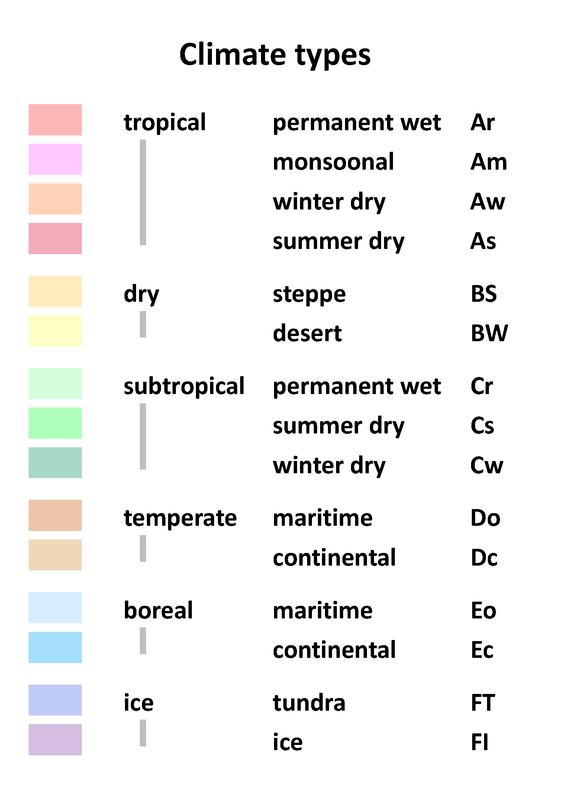 Köppen climate classification modified by Trewartha and Rudloff.